Climate Adaptation: The State of Practice in U.S. Communities, is the first study to examine in depth actions that multiple municipalities are taking to address climate-change fueled events like flooding, heat waves, wildfires and intense storms. It found that more municipalities are preparing for climate risks than is conventionally believed, that many of those actions support multiple community goals and values, and that despite the progress much more work is necessary to comprehensively address climate risks. Adaptation actions at the community level are reducing vulnerability to climate variability and extreme events, and possibly to climate change. Addressing only climate variability and extreme events may constrain the effectiveness of long-term climate adaptation. Communities can begin addressing climate change risks now. Communities can overcome barriers to action, identify opportunities, and begin implementing adaptation measures. Adaptation actions explicitly addressing climate change are in a formative stage. 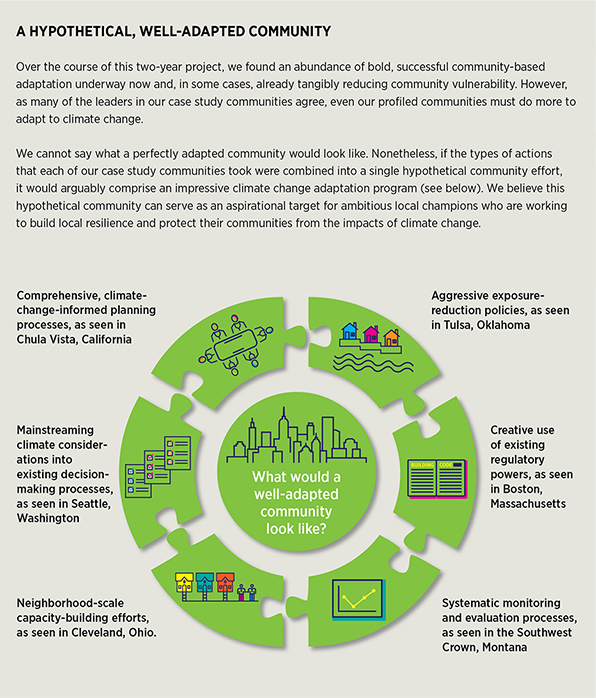 Through our case study communities, we have identified components of a hypothetical, well adapted community (see graphic below). Community-based champions of adaptation action and adaptation professionals should use vulnerability reduction as a key baseline to assess and facilitate progress in adaptation. Adaptation actions in 17 U.S. communities were explored in depth. Click the slider below for key points of the case studies.